I have a happy announcement!!! My recipe Paneer-raw banana kababs has won third place in Tarla Dalal's recipe contest!!! Here is the link announcing my winning entry!!! You can see the Contest archive here too. This Khichdi originates from Gujarat... it is called Ram Khichdi there in Gujarat....this is definitely a comfort food, one-pot meal, and its life long companion is Gujarati kadhi. 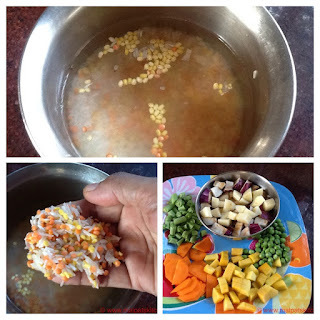 This is such a healthy Khichdi, with 2 kinds of dhal along with basmati rice, loads of vegetables, different kinds of spices to accentuate the aroma, and ginger and black pepper to perk up the flavour....and what more you want??? And.,...and...this is a no onion-garlic dish too!! Look how many spices have gone in to make this Khichdi a tasty one!!! 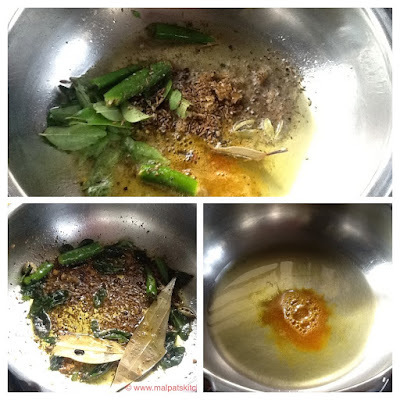 Heat a pressure pan with above mentioned oil and ghee(Don't be miserly to use this quantity of oil and ghee. You certainly need this to give that texture to Khichdi). first add turmeric powder, then cardamoms, cloves, bay leaf and cinnamon pieces, now comes the time to add the chopped ginger, curry leaves, pepper and jeera. Saute well. Now add all the vegetables, then the soaked rice and dhals, then add salt and the measured hot water. I cover the pressure cooker vent like this, keep the flames on the lowest and cooked for 15 minute, the picture on the right side of the pressure pan shows how the khichdi looked after 5 minutes, then the below 2 are , how it looked after 15 minutes.. Close the lid, after mixing it well, and allow to rest for 5 minutes. *Split moong can be replaced by tur dhal also, but moong and masoor have similar cooking time, tur takes little bit more time. 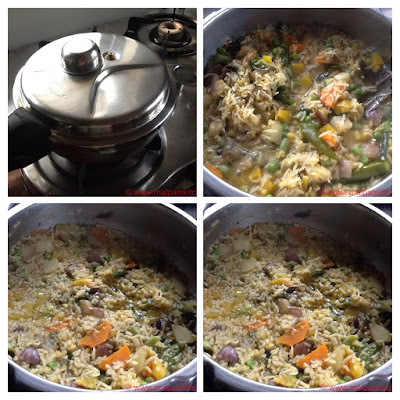 *This Khichdi has an unique taste of the Ven Pongal and Vegetable pulao, blended into one. Hence, this can be given the name "Fusion dish". This explosive combination of gujju kichadi and kadhi calls for a compliment only in gujrathi. Khuba ja sarasa mate thaya Che!!!!! i.e. Very nice YUMMMM!! Hi Mala, I loved this full-of-vegetables recipe. You know, I like so much to have plenty of vegetables in my diet since they're so healthy and easy for the body to digest. This recipe will be my next dish for sure. Thanks for sharing.